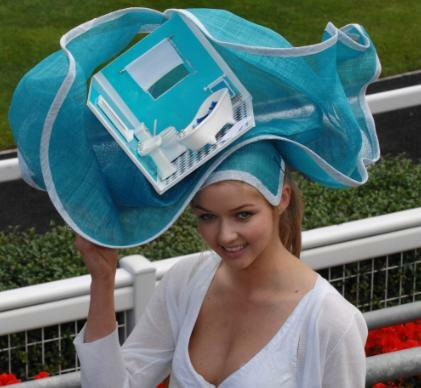 It's not everyone that can carry off wearing a small bathroom on their head. I think this fashion faux pas tanks. We'll flush out a winner Saturday. Have Bathroom - Will Travel. Suddenly, 'golden showers' don't seem like such a bad idea. The airline said my carry on bag had to fit in the overhead bin. They said nothing about my hat. Who forgot the bubble bath? Lady Gaga's Gag Bag Hat! Bed, bath and beyond reason. Really bad television crossovers: America's Next Top Model contestants host an episode of Extreme Makeover: Home Edition. Kate Middleton tries her hand at bathroom humor. Kentucky Derby FAIL: sure it a chance to show off your fashion and money, but having to pay for 4 extra seats behind you for your hat is a little overboard! Linda thought she would up the ante at the Miss Kohler 2011 competition. Where The Hell Is Miss Manners When We Need Her? Is There A Spring In My Step?